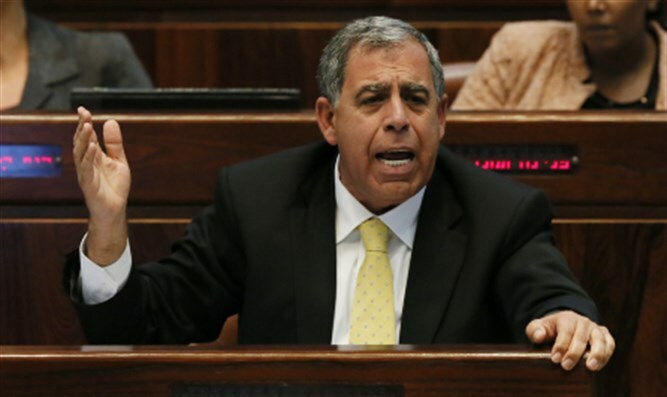 The Knesset legislative committee will discuss on Sunday a law suggested by MK Mickey Levy (Yesh Atid) which would revoke the salaries of MKs suspected of committing security-related offenses. The proposed law would affect MKs against whom indictments for security offenses were filed and who are suspected of crimes which carry seven or more years in prison. The law would revoke both the MK's salary and any other government payments he was receiving. The new law was proposed after the Knesset's Ethics Committee refused to revoke the salary of MK Basel Ghattas (Joint Arab List). Ghattas was indicted for security offenses, including smuggling cellular devices to Hamas prisoners in order to allow them to run terror operations from jail. Levy said, "The current situation cannot continue. It cannot be that a member of Israel's Knesset betrays Israel, is indicted, but continues receiving a government salary. This proposal will put an end to this absurd situation in which Israeli citizens' money goes to pay those who are intentionally trying to hurt them and endanger their lives. "I hope the government's ministers will ignore coalition politics in Sunday's vote. I don't see how it can be any other way."